Warning: Graphic matter. Testimony of Navy soldiers attacked by terrorists reveals a crueler scene than once known. “I thought I was going to die." Previously unreleased testimony of Navy commandos attacked by IHH terrorists reveals a more brutal scene than formerly thought. “I thought I was going to die,” one soldier told the Turkel Commission. Videos from the May 31 clash have shown that IHH and other Muslim terrorists brutally attacked the defenseless Navy commandos, who had expected to be confronted by peace activists. However, the now-released testimony from wounded commandos reveals they were cruelly beaten while their hands were tied behind their backs and were bleeding profusely. 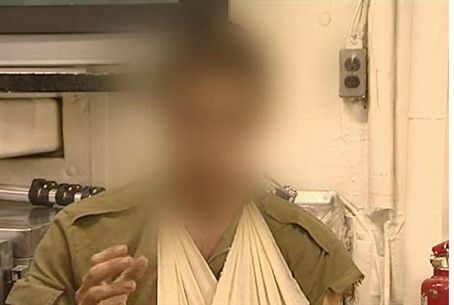 The Turkel Commission’s report Sunday also disproved IHH claims that they treated the wounded soldiers, whose lives were apparently saved by the presence of passengers not involved in the fighting and correspondents with cameras who documented their beatings, deterring their captors from killing them,” the report stated. Fifteen terror activists had gathered on the upper deck of the Mavi Mamara as soldiers rappelled down ropes from their hovering helicopter. After the soldiers landed, scores of others, who had been waiting nearby, joined the ambush. One commando graphically described how five terrorists attacked him with iron bars, clubs, metal chairs and fists. “They choked me and tried to throw me into the sea from the starboard side of the Mavi Marmara…I realized that my life was in danger and that they were trying to kill me and to throw me into the water to kill me…At that point I felt a sharp blow to the left side of my stomach, and I realized that I had apparently been shot,” he testified. The terrorists showed every sign of wanting to die as “martyrs,” according to the commandos. One of them stated that wounded terrorists tried to hamper medical treatment by removing and tearing off medical equipment. “The IDF soldiers were forced to evacuate wounded operatives against their will to save their lives, while other operatives physically tried to prevent the soldiers from reaching them,” the Turkel report related. The soldier also faced moderate violence on at least two other ships in the six-boat flotilla. The Sfendoni 8000 boat “maneuvered itself very close to us, it was on a collision course,” said a commando. “That is, it simply tried to run us down, and chased us even after we tried to evade it. It got as close as 20 meters, a very short distance in naval maneuvering, and it presented a clear and immediate danger to our vessel…Finally we made a sharp turn and got in back of it…"
On another boat, activists rolled out barbed wire on the deck, forcing the commandoes to descend to the roof, endangering their lives. The Navy soldiers clearly were not prepared for an armed battle. “In accordance with the preparations we had made, as well as briefings and simulations of what we would do, I still thought we would be faced with proportional resistance from peace activists and that at worst we would have to get a little physical,” one soldier told the commission. “Before my feet hit the deck about ten men jumped on me and started beating me with clubs, iron bars, their fists and anything else they could find... I knew my life was really in immediate danger…"
“They acted like they were fighting an enemy and had come to kill him, that is, kill me. I kept waiting for the blow to my head that would kill me… My face was covered with blood from the wounds to my head. The mob kept beating me and shoved me below decks..."
"At that point I was certain I was going to die…"
Commando “B” testified, "I resisted as best I could but without success. I remember they kept screaming, their eyes were insane and full of hate, and I knew it was the end and they were going to kill me…"
“I saw that there was massive bleeding and I could see my intestines spilling out of my stomach… While they were dragging me down the ladder I saw soldier “C” lying on the bottom deck with men acting crazy all around him, they kept beating him without stopping."